Yes, we’re having a Tag Sale. It’s been 30+ years in the making – 2 children out of the nest, 2 sets of parents’ homes that were downsized, and stuff we had before we decided we needed an upgrade or a remodel. 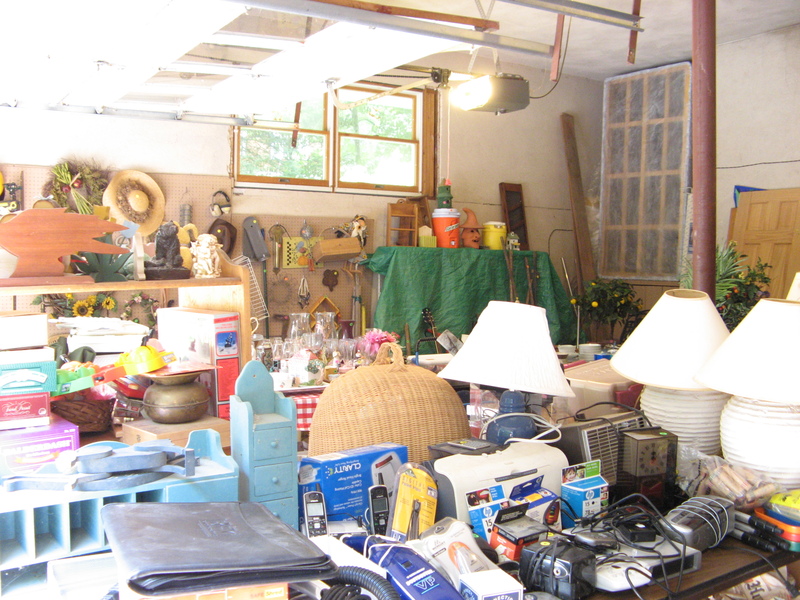 For the past several weeks we’ve been gathering random items and cleaning the basement, attic and storage unit (and it would seem other people’s storage space too). Why did we need all this stuff? Did we ever really “need” it? By saving it, we’ve only accumulated dust, rust, chips and cracks. Some were kept for sentimental reasons. My grandmother’s rose-colored glass lamps (John always hated them, so we never used them). Wooden dollhouses from John’s mom that I always wanted to decorate (never happened). Then there’s the accumulated stuff. How many placemats does one need? No, my kids don’t want my first set of stoneware. Remember when trolls were all the rage? Of course, we are hoping to make some money by selling all this stuff. My parents could use the extra income. My daughter could too. And oh yeah, we’ve got this wedding to plan (and pay for)! John and I are committed to living more simply. Not accumulating stuff. Practicing what we preach – or at least try harder. One great resource for guiding such a lifestyle is Alternatives for Simpler Living. We’ve followed their suggestions at Christmas and I think our daughter’s upcoming nuptials will glean ideas too. God asks us to give up all our junk and to focus on a life center in the Way of Christ. Doing justice, loving mercy and walking humbly. (Micah 6:8). I hope our tag sale helps us get rid of more than the stuff now tagged and waiting in my garage for the 7AM rush. I’m sure we’ll be giving away lots of this stuff. It is said that one person’s junk is another person’s treasure. Let’s hope so. And let’s focus on God’s treasure above all else. I, too, was amazed at the treasures we had collected along the way after 25 years of marriage and our first move. We have just been learning how much you don’t have to have since we moved from a 4 bedroom house to a 2 bedroom apartment. Of course, we had to have storage space for some of the things but I really wonder how much will come back in to our next house!